I have worked so hard to move on with my life. I try to not look back. I hold little regrets. But I can't deny: I tried. I yearned. I ached. I hoped to be a mother. Once we decided to live as a childless couple, I did my best to eradicate myself of all evidence of a hoped for baby. At first, it was how I dealt with the pain. I couldn't stand the reminders I was surrounded with. After a while, it felt freeing. But even then, I still found myself hanging one to one thing, well, two things. The blue blanket was the very first one I learned to crochet on. When we first decided to adopt, we had the option to say if we wanted just a boy or a girl. At that time, (maybe because I have such a need for control), we decided to look for a boy. As I sewed around the blanket, I could picture our son in it. Rocking him in my arms. After some time, we felt it best to broaden our search to either a boy or a girl. 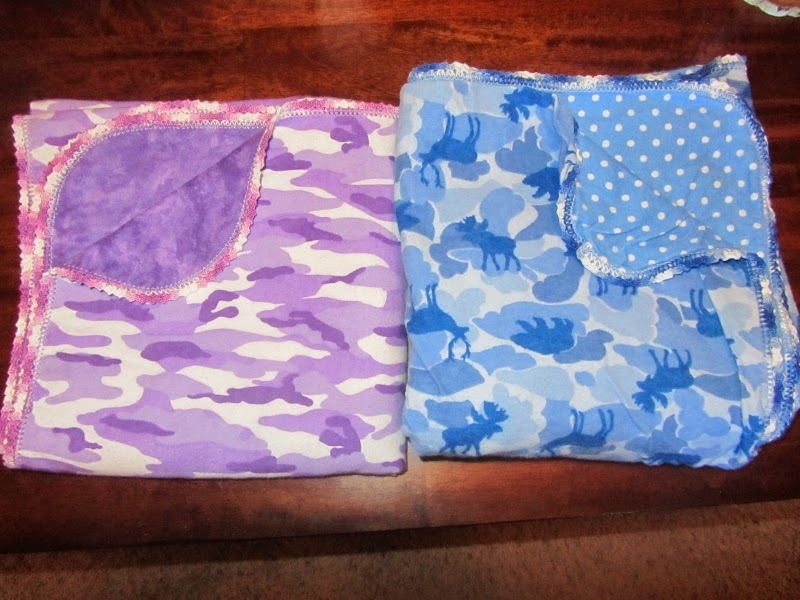 So when I saw the purple camo blanket, I knew I needed it, just in case we were blessed with a little girl. As before, I pictured our daughter swaddled in it. Over the years, I've had many opportunities to gift these blankets. But I always push them to the bottom of my pile and tell myself I will deal with them later. Once again, I find myself with the perfect opportunity to gift the blue one to a little boy. Furthermore, a little boy I already love. But I don't know if I can do it. The little blanket means so much to me and I worry no one will understand its importance. The love that went into it. To them, it'll just be a blanket. But to me, it was a dream. It is the only thing I have left to show that we tried to be parents. I just don't know that I can let go of that yet. Others may ignore or forget that we were almost parents, but I never will. Almost 16 years later, I still have all my maternity clothes, as well as the very few things we bought for our baby girl who never came home. If you don't want to or feel able to give up your few things, then don't! I don't think I knew that at first you were just trying for a boy! Those 2 blankets are darling and if you don't feel up to getting rid of them, then don't. Keep them as a reminder of how hard you tried and how strong you are!